Welcome to my life...: The hardest longest 14 days of my LIFE! On June 29th I headed to the airport to drop off my brother and his wife, along with my 7 year old baby girl to head back to Louisisana. They have been asking me, along with my parents, for the last year if they could take her for some time during the summer. Finally my sister asked if they could have her for a month. Of course my reply was NO. That is too long! So we agreed on 2 weeks. I then, talked to her dad and we talked about if we were okay with this for sure before they booked the tickets. WE agreed and then they booked the tickets. On the day I took her to the airport I was super strong and I decided I was not going to cry. I was very proud of myself for not crying up to this point. I would have waited until I drove home to cry, but it didn't last that long. After hugging my baby girl and I pulled her away from me, she had HUGE alligator tears in her eyes. None fell down her cheek, but after seeing that I lost it. I grabbed her tightly and didn't want to let her know. I made it short and sweet and then talked about all the fun that they were going to have and then watched them walk inside... I left once I couldn't see them anymore or once I noticed she wasn't turning around anymore. I cried the whole way home. Her being at her dad's house I have gotten use to, but this was totally different. She was in a different state and that was what was putting knots in my stomach. I totally trusted my parents and my brother and sister with her... it was just the fact that she was so far away from me if anything happened. It got easier as the days went by. I walked around feeling lost. My little mini me wasn't here to talk my ears off and she wasn't here asking me questions. It was the longest 2 weeks of my life! My parents and her have their boarding passes printed for tomorrow's flights and today is pack day down there. I am super excited, words can not explain it all! She had such a great time down in Louisiana. I can not thank my family enough for showing her a great time. She was able to spend time with her grandparents, uncles, aunts, cousins, great aunts, great grandfather and extended cousins. She went to the water park down there and she swan many many days. She had a few melt downs with missing her dad and I, but she did such a great job and I am so super proud of my baby girl. She has made me extremely proud of her. I can not wait until tomorrow evening when I can hug my baby girl and not let her go! 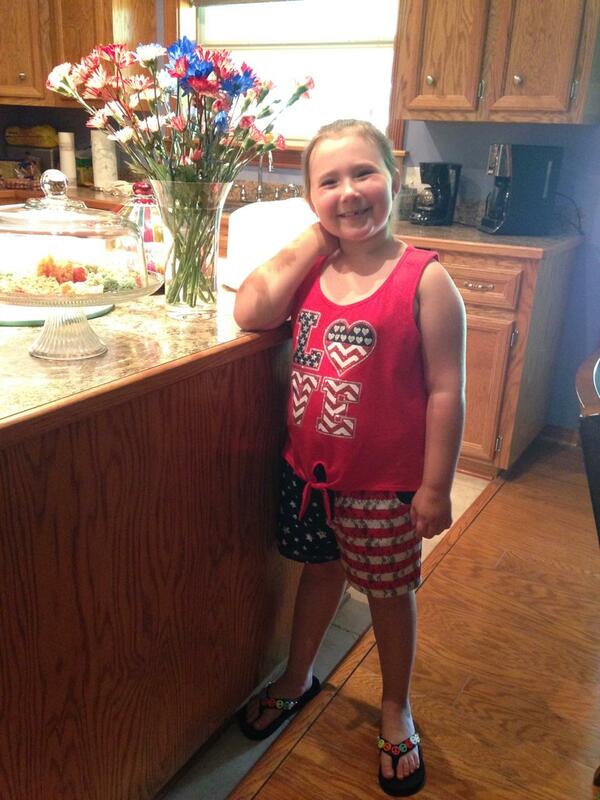 My princess on the 4th of July at MawMaw's house! It's hard to let go. I am proud of you. so glad your mini me is back with you.i feel your pain. i just went to visit my sister and her family, also my brother and his family. plus a few other family members. it was hard for me to tell my siblings by. my sister and i cried so much.